Data visualization is a useful tool to analyze exploratory data and display the results. This article attempts to explain a few data visualization exercises which aim to analyze a composite dataset consisting of 911-phone records as well as the subsequent police report filings. Incident number (a unique id), incident date, incident time, location, zip codes, significance, incident description, and incident type. The dataset includes data from the years 2012-2015. The original dataset is well ordered and nominal in most attributes. Instances are extensive but well maintained with no missing values. One challenge was converting zip code data into latitude and longitude for plotting, which was mitigated using Tableau 9.2. 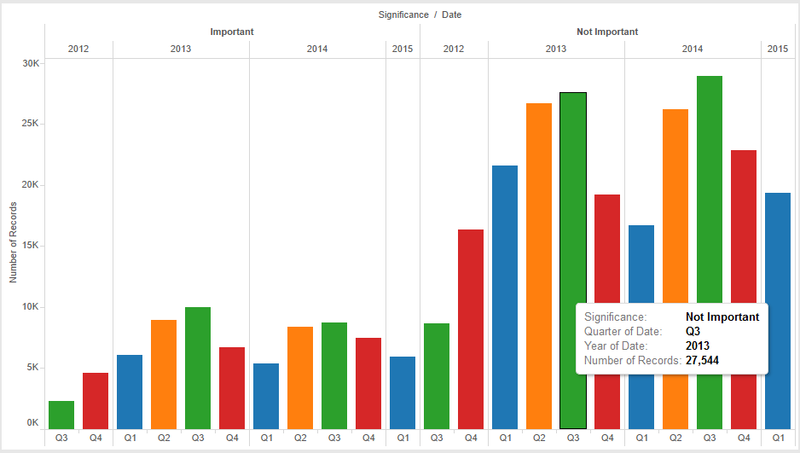 Tableau has built-in graphing and histogram development features. Graph 1 shows the number of records for each quarter where the records are divided into important records and not important records. It can be seen that the number of records is relatively high in summer and autumn. The proportion of different crime types of Madison is displayed in Graph 2. Petty theft happened to be the major crime and none of the top 10 crimes were of violent nature, which reaffirms Madison as one of the safest cities in USA. People called 911 for different reasons which are summarized in Graph 3. The most pressing reasons included fire alarms and information in the important and non-important category respectively. With Madison being famous for its drinking culture, I wanted to see when people got into trouble for drunk driving. It is not surprising that the majority of cases happened around midnight but I was surprised to see that people were drunk driving between 5-7 PM as shown in Graph 4. Based on zip codes, the crime density for different areas of Madison is displayed in Graph 5. 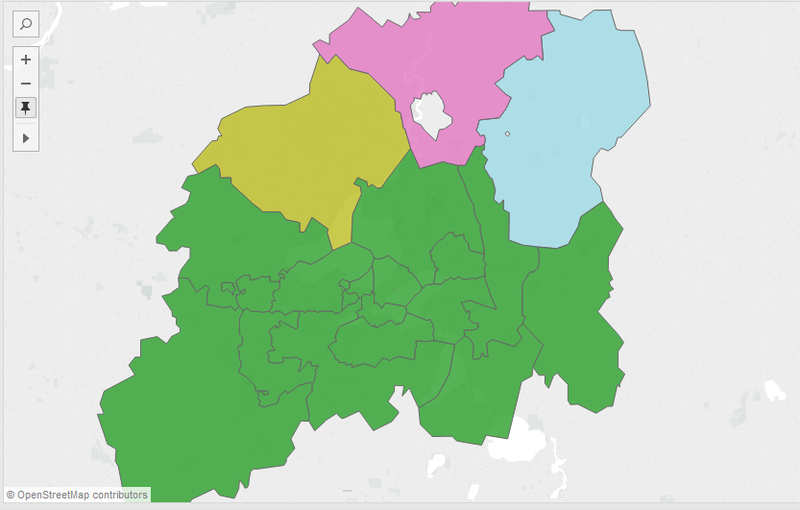 The darkest shade of green is the most crime prone area while the lighter shades denote low crime density. Historically, the area around the east towne mall happens to be the most crime prone. The university area is relatively safe and crime dovetails as we move out of Madison perhaps due to the low population. The major crime in each zone is shown in Graph 6. Weapons violations come out on top and not surprisingly because the university area is a no carry zone. The Beltline area has high amount of traffic violations as one of the traffic heavy areas of Madison. 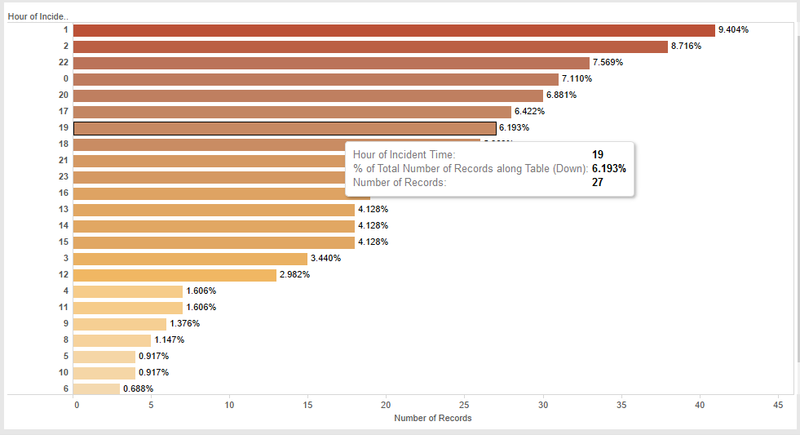 In this article, data visualization techniques are employed to analyze 911-phone records. Further work can be performed like checking the correlation between cases in the police report and 911 calls made and deriving insights. Statistically analyzing (clustering) the data can also narrow down the crimes to street levels and perhaps help better policing. This is an attempt to build on work done by Sachin Bhat, Girish Krishnan and Abisheik Mani as part of their course in the spring of 2015. I would like to thank Prof. Kaibo Liu for his support. This was a very interesting study and I really enjoyed reading it. However, I noticed that it was conducted using data from the UW Madison Police Records. I’m curious as to if the proportion of call types (i.e. type of offense, important/non-important call) would be different for the Madison Police department compared to UW PD. Additionally, I think it could also be interesting to include the data of offenses caught by police on duty without any calls being made. Perhaps a Chi-Squared test could be used. Thank you for sharing your findings! I found it interesting that the 3rd Quarter of recent years were the most popular quarter for both important and unimportant calls. I am interested in seeing how Madison’s call statistics compare to other large college towns in the United States, as well as similar-sized cities and how they compare to the top categories of important calls. For example, is theft a common issue nation-wide, or more of a localized problem in Madison, WI. This is very interesting, especially living in Madison for the passed few years. The most interesting would have to be that drunk driving occurs so frequently at 5-7 PM. It would be interesting if there was a visualization on where these drunk driving incidents were and if that correlates at all with where there is most crime. I know it is a trend in many cities that crime spikes in the summer. However, I would not have expected that to happen in the data from UWPD because of the nature of the student population. The campus is usually pretty quiet in the summer because there are far fewer students taking classes in the summer session compared to Fall and Spring. I would have expected crime to peak over fall and winter; this finding is interesting! Thank you for sharing your findings with us. I thought that many of the graphs did a nice job of conveying information in an easily understandable manner. But, I do have one suggestion. In your highest prevalent crimes visualization, I believe it would be easier to understand with proportional labels. I don’t really understand what the colors mean. Overall this is a very interesting project. Great analysis! It was super interesting to see from the second analysis that petty theft is the major crime in Madison and that none of the top 10 crimes were violent in nature, reaffirming how safe of a city Madison is. It was also comforting to see that campus is a very safe area compared to other Madison neighborhoods. I wonder what the records from UW PD look like. I’m sure almost all of these calls happen on campus and perhaps that would affect how safe Madison would look on the graph with other neighborhoods. But great analysis! Very interesting post. Great analysis! I found it interesting that the data reaffirmed Madison as one of the top 10 safest cities (in 2016), especially with all the crime happening recently. That shows how much can change in just a couple years. I wonder how much the data has changed in recent year- if it shows more violent crimes being reported. I agree with how it was surprising that people are drunk driving around 5 pm. That definitely seems odd. It was an interesting analisis which shows coherent results about the crime in Madison. It would be clearer for the lector if there were legends in all the graphics since I had to struggle in the first one to understand which color was for each season. Regarding the drunk drivers, I guess that a likely reason for people drunk at 5pm could be that there are more alcoholic police controls at that time than during the night or that people drunk at 5pm are less common so they call more the police attention. The fact that there are more reports about that people at 5pm doesn’t have to mean that there would bemore people driving drunk at that time. Useful findings that seem to confirm prior beliefs. I did an analysis on Chicago crime and it was apparent that theft was the number one crime year after year so I wasn’t surprised to see that. It also confirms my prior belief that the west side of Madison seems to be the safer side. Thank you for sharing your analysis. It made sense to me that there were high crimes during autumn when new students were arriving in Madison but I was surprised that the highest number of crimes were during the summer months as there are typically less students in Madison. I am also curious how drunk driving was classified into the crime types, would be grouped with traffic incident? Overall, I think this information could be very useful for appropriate attention to areas that are more error prone. I know that at malls back in Waukesha and Milwaukee county, they see crime rates spike in the summer as middle school and high school kids are out of school. This was a trend that wasn’t followed in the Madison area, which is a little surprising to me. I do wonder what the proportion of 911 calls/ arrests were college students related in the summer vs non summer months. Thank you for this analysis and the visualizations. The article did a good job of explaining where the data came from and some of the preprocessing/cleaning methods that were used on the data (e.g. converting ZIP codes into latitude and longitude coordinates, a function that Tableau can do which is super cool). The analysis also made some interesting yet valuable distinctions between violent and non-violent crime, a difference that I had never thought about before. Overall, perceptive analysis and good paper! It would also be interesting to compare this crime data (from UW Madison PD) and the city of Madison’s police department to see if there are any differences in trends. I enjoyed reading your work especially since I have been, and currently, a resident of Madison for a few years now. Graph 5: Most Crime Prone Areas makes sense if I’m understanding the map correctly, and that is that the most crime occurs near the downtown area. Another cool graphic would be interesting to see is the streets and intersections in Madison that hold the most crime. I sure know a few spots in the downtown area that would be high up on that list. After reading the title of the article (Data Visualization with 911 Phone Records) and finding out that the study was conducted on the city of Madison, I was almost positive that a large portion of the calls for 911 would have involved alcohol. I came to find that alcohol in indeed still a large motivator for crime in Madison, but not in the top 10 overall crimes committed in the city. 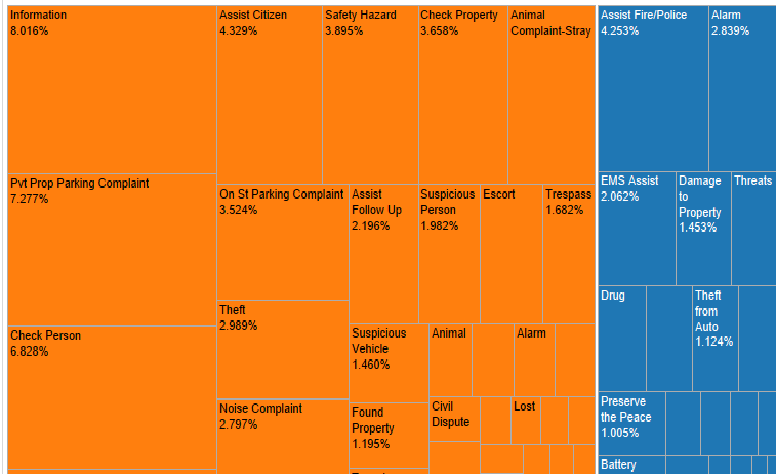 With petty theft topping the chart for the most prevalent type of crime, I would love to see a heat map of where 911 calls for theft occurred around the city. This visual would enhance the understanding of where the most theft was being reported. For the first visual, I would like more of a description as to what qualifies a record as “important” or “not important”. As for the data seen, it does not surprise me that the warmer months have higher crime rates as more people are outside and on the street. I would like to see how states like California, who have warmer months throughout the entire year, compare to colder states like Illinois regarding their crime rates throughout the year.